According to Hindu theology, supreme power vests in the forms of animal or human on Earth. Lord Vishnu incarnates to rid the world of evil forces. Dasha Avatar is about the various incarnations of Vishnu. In alignment with Darwin’s theory of evolution, the Dasha Avatars of Vishnu evolve from a the form of a fish to a noble man. The book Dasha Avatar focuses on how Hindu theology is based on the concept of Avatar. Vishnu takes birth in various forms of animal and human beings to cleanse Earth of all evil from time to time. 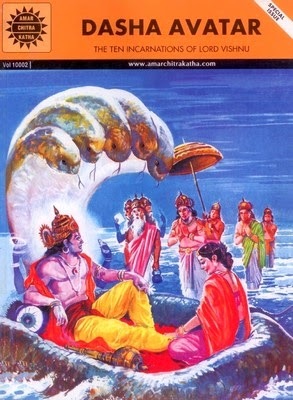 The avatars of Vishnu appear in various Yugas. Kamala Chandrakant was Indian author. She has penned down several stories for the Amar Chitra Katha and is has authored the book Dasha Avatar.